If you’re an mperks member head over here to see if you have Fisher-Price coupons under the Toy tab. These are labeled as “Store coupon”, which means you can use these with a manufacturers coupon. Plus, on Friday & Saturday you can get an extra $5 off your purchase of $50 or more. I suggest splitting up your transaction if you plan to use the $5 off coupon more than once. You will be able to get $5 off on top of using any other coupon(s) even if those coupons bring your total below $50. 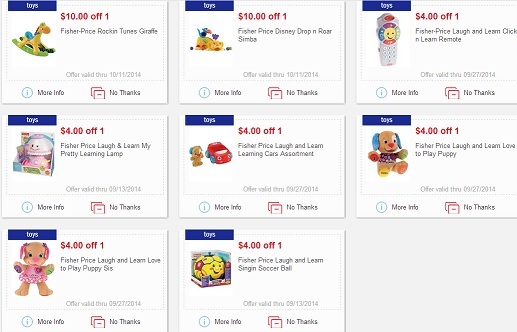 There are also Fisher-Price printable coupons over here that you can use any store that accepts them. There is a limit of two prints per coupon. This entry was posted in Baby Deals, Meijer, Walmart. Bookmark the permalink.